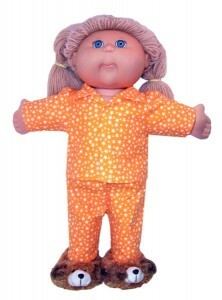 Every doll needs a pair of winter pyjamas so this pattern is for all my customers who have been asking for my Winter Pyjama doll clothes pattern in the 18 ½ inch Cabbage Patch Kid size. It includes a collared, long sleeve shirt with easy Velcro fastening at the front and long pants. If you have just made a pair of pyjamas for your daughter/granddaughter, you may have enough fabric left over to make matching pj’s for her doll. Wow, I can just see how excited your little girl will be going to bed with her doll wearing matching jammies! Buy the pattern today and make it up in time for dolly to go to bed tonight.